Baked Steak Fajitas feature thin slices of spiced flank steak and fork-tender strips of peppers and onions roasted on a baking sheet. 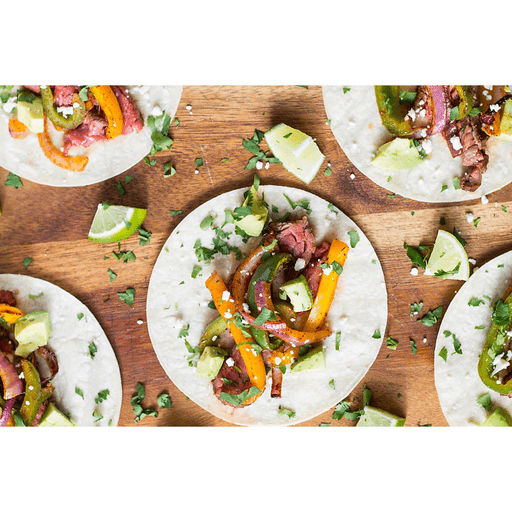 Serve fajitas in warm tortillas and top with fresh cilantro, avocado and lime juice. 1. Preheat oven to 450°F. Coat a rimmed baking sheet with cooking spray and set aside. 1. In a small bowl, combine chili powder, paprika, garlic powder, onion powder, cumin, salt and pepper. Divide spice mixture in half. 1. In a large zip-top bag, place steak, 1 Tbsp. olive oil, lime juice, soy sauce and half of spice mixture. Close bag and gently mix. Set aside. Optional: Marinate steak in the refrigerator for up to 24 hours. 1. Slice peppers and onion and place in a large bowl. Add remaining 1 Tbsp. olive oil and half of spice mixture 1. toss to coat. Place veggies onto the outer edges of the prepared baking sheet. 1. Remove steak from bag and place in center of sheet pan. Bake for 15 minutes. 1. Turn broiler on to high and broil for 5 minutes or until desired doneness is achieved. Remove pan from oven and let rest for 5 minutes before thinly slicing flank steak against the grain. 1. Serve cooked meat and veggies in warm tortillas with optional toppings. Top with lime wedges, chopped cilantro, sliced avocado, pico de gallo, cotija cheese and plain Greek yogurt. For gluten free: Use tamari sauce instead of soy sauce. Calories 310, Total Fat 12g (Saturated 3.5g, Trans 0g), Cholesterol 50mg, Sodium 250mg, Total Carbohydrate 32g (Dietary Fiber 2g, Total Sugars 3g, Includes 0g Added Sugars), Protein 20g, Vitamin D 0%, Calcium 10%, Iron 15%, Potassium 15% *Nutritional values are an approximation. Actual nutritional values may vary due to preparation techniques, variations related to suppliers, regional and seasonal differences, or rounding.